Must be a "hunting dog"
Dogs are supposed to be man's best friend, but for Hunter James Harris his pooch wasn't so much good as it was a good shot. Harris was shot by his dog in a bizarre accident, when, according to officials of the Iowa Department of Natural Resources, he placed his shotgun on the ground to cross a fence and his dog stepped on the trigger. Harris was hit in the lower leg and is listed in good condition at an Iowa City hospital, and thankfully, no other people or animals were hurt in the incident. Danish police have appealed for public help to track down a kangaroo that escaped from its owner's home in Copenhagen. Two of the fleet-footed native Australian marsupials escaped from their owner's residence in the Copenhagen neighborhood of Amager on Monday. One found its own way home today but the second remains on the loose, police said. Authorities in Germany are trying to re-capture 7,500 mink who have escaped from a fur farm. The mink stole away after unknown criminals opened a large number of cages and destroyed fences at a fur farm in the early hours of Friday morning, police reported Friday. There is speculation that animal rights activists, who have repeatedly criticized fur farms as cruel, may be behind the incident. However, police admit they have little evidence to go on and are making no statements as to possible perpetrators. Royal Navy officers are paying tribute to Simon the cat, a rat-catcher on the HMS Amethyst who continued his duties despite being hit by shrapnel and singed during shelling raids by Chinese communists on the Yangtze River in 1949. Simon stuck to his task despite injury during the 101-day summer siege that followed. The communists withheld supplies for over three months while they used the ship as a political bargaining chip. But the black and white cat kept up morale and crew credited him with saving their lives by protecting dwindling food stores from a rat infestation. A Tribute to Fup. Store Cat. Worth $22,156.63? The Daily Mail reports that the Ashera is the world's "largest, rarest and most exotic" domestic cat. The large pointed ears and eye-catching coat come from two wild bloodlines, the African serval and Asian leopard cat, crossed with an undisclosed domestic breed. About 7 percent of dog owners say they have purchased a Halloween costume for their pet, up from 4 percent in 2004, according to the American Pet Products Manufacturers Association. If you're part of that trend, beware of the hazards of costumes for our furry friends. Some tips: • Be sure that straps aren't buckled too tightly, because they might constrict air passages and cause choking. • Make sure the costume lets the animal move comfortably and does not restrict vision or hearing. • Don't let your pet chew on the costume; it may contain dangerous dyes and other chemicals. • Make sure no part of the costume is flammable. • A reflective costume adds to safety after dark. If you do dress up your dog on Halloween night, don't have him wear the costume for too long. And always keep dogs on a leash, as there are lots of distractions around. One final warning: Don't let dogs or other animals get close to a candlelit jack-o-lantern. It could be dangerous for the animal and become a fire hazard. A clam dredged up off the coast of Iceland is thought to have been the longest-lived creature discovered. 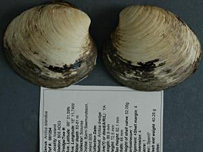 Scientists said the mollusc, an ocean quahog clam, was aged between 405 and 410 years and could offer insights into the secrets of longevity. Researchers from Bangor University in north Wales said they calculated its age by counting rings on its shell. According to the Guinness Book of Records, the longest-lived animal was an Arctica clam found in 1982 aged 220. Swiss Chalet Pet Estate ($8,000) This beautiful house will make your animals feel right at home. This chalet two-dog house designed and built by Alan Mowrer, can be constructed with countless interior and exterior options. Whether it is cable, running water, electricity, central air or a wireless communication system, Alan can accommodate your wishes. This fun coat conditioner contains mica chips to add a fun sparkle and shimmer to your dog's coat. This high-quality conditioner is non-staining, antistatic, and also acts as a light-duty detangler. Unscented spray is safe for puppies over 6 weeks old. Not safe for cats. Kong Time for Dogs KongTime, all day entertainment for the home-alone dog™. Put dog food or treats inside a Kong toy and what do you have? Magic! Your dog will happily chew at the Kong toy, trying to get out every last morsel. It's fun! Simply fill the four - included with purchase - Kong toys with food. At random intervals over the day, the KongTime will dispense a food-filled Kong toy for your dog. Before a toy is dispensed, a sound beeps, indicating to your dog that it's time for fun! Do you wonder how the scenes involving owls were created and shot for the Harry Potter movies? This article has some interesting "behind the scenes" information. Animals received royal treatment during filming. In many cases, the animals received better treatment than the human actors – such as the scenes with the cats Mrs. Norris and Professor McGonagall. Many of the scenes take place in a real castle, which was actually quite drafty and cold. For the cats' comfort, they were provided heated floors to keep their paws and their bodies warm. The human actors had no such comforts. The world's most endangered cat species may be slightly less endangered than previously thought. A new population of Iberian lynx has been discovered in a remote area of Spain—raising the number of known populations from two to three—a conservation group reports. The newfound population appears to roam private estates in the Castile la Mancha Province of central Spain, according to the international conservation group WWF. The two other known populations occupy isolated portions of Andalusia in southern Spain. Bob and Judi Olwine's home in Woodstock, near Patapsco Valley State Park, is where the deer play. Judi and her husband decided to do what any baffled suburban couple would do in this situation: They got rifles from the hall closet and ... Just kidding! A brightly colored tropical frog under threat of extinction is the focus of a new research project hoping to better understand how environment and diet influence its development and behavior. Biologists from The University of Manchester have teamed up with experts at Chester Zoo in the hope that their findings will not only help save the splendid leaf frog Cruziohyla calcarifer from extinction in the wild but provide clues as to how it can be better catered for in zoos and aquariums. This sculpted cake, created by Marked for Dessert, depicts momma frog and baby frog. Made entirely of cake and rolled fondant, this cake was created for a baby shower. The Rolling Dog Ranch Animal Sanctuary in Montana rescues and shelters disabled animals. Every animal who arrives at the sanctuary gets another chance to have a safe and loving home. Residents include blind dogs, blind horses, deaf dogs, blind cats, and others with medical issues like muscular dystrophy. Although these animals may have disabilities, they do not consider themselves handicapped. They just want to get on with life and enjoy themselves. Thanks to the support of the sanctuary's friends, that's what they get to do there. Pal is a 10 year old Great Dane, dressed up for Halloween as a race horse complete with her friend Snap the Chihuahua as her jockey. Does your dog have a great Halloween costume? Then enter the Second Annual PupLife.com Dog Halloween Photo Contest. If your dog’s photo is chosen, you could win a $25, a $50 or even a $100 Gift Certificate. Hand made costumes are encouraged, but store bought costumes are fine, too. The Central Vermont Community Land Trust usually has no objection to a service animal moving into its apartments. But Patty Cooper's service animal is a horse of a different color: a black and white miniature horse, to be exact. The nonprofit housing group is trying to figure out whether it can accommodate the disabled woman's new companion amid concerns about the horse's need for grazing space and whether it will be adequately housebroken. A blue lobster, so rare that only one in two million have the color, has been trapped off the Massachusetts coast. The lobster, nicknamed Betty Blue, was found in a trap off Minot's Light, one mile offshore of Scituate, Mass. The lobster is so blue that "she glowed in the trap," said Eddie Figueiredo, who trapped the pound-and-a-quarter lobster. The Latin name of Panthera leo krugeri is not limited to white lions. It applies to all South African lion subspecies; the prides of which are mostly located in Kruger National Park and nearby game reserves. White lions are not albino as they have pigmentation which shows particularly in eye, paw pad and lip colour. The correct term for their condition is leucism, a state where there is near-normal eye colour, but loss of pigment in the skin and fur. The cause of the unusual colouration is the same as for the white tiger. A recessive gene which results in the white appearance is found in a very small number of captive lions. White specimens usually have a yellowish-brown or golden eye color which is very similar to their tawny cousins, though some have bluish coloring like the white tiger. Listen to over 600 recordings of wildlife from around the UK. Captured by three British wildlife enthusiasts from the 1960s to the 1990s, most are published here for the first time. Great for small dogs, pet birds, and free roaming lizards! Makes a great addition as an inside garden spot for plants and seedlings. Give your cat "the outdoor experience" within the safety of your home. If you have a cat and a window you will enjoy The Feline Solarium. Cats naturally enjoy the outdoors and love to sleep in warm sunlight. You will make your best friend so happy! So - where exactly would you wear this to? Woolies are created using a technique called needle-felting. In addition to selecting the highest quality pure carded bulk wool from Australia, America and England in various colors, each Woolie is treated to be moth-resistant. To begin, the wool is pressed together or rolled tightly against itself into a basic form. This roughly formed wool is then sculpted into a specific shape with a felting needle. There are a bunch of poses to choose from. Flisek the cat just doesn't want to share. Video: Baby Porcupine Eats A Banana and Has Hiccups! Yes, they have unleashed devilishly decorated spooky Halloween Eyeball cupcakes for all those crazy canines - original and spooky good! A wonderful soft treat any dog will love. Walton County’s fi rst-ever documented leatherback sea turtle nest has hatched, and 23 babies have made their way safely to the Gulf of Mexico. After 79 days of close watch by the South Walton Turtle Watch Group, Walton County’s sea turtle nest No. 12, located in Seagrove just west of Seagrove Villas, came to life Oct. 6 following the day’s heavy rain. At 9:15 p.m., Turtle Watch Volunteer Joe Burton checked on the nest and found a tiny flipper coming out of the sand. After making several phone calls, Burton, fellow volunteer Sharon Maxwell, and 23 other spectators crowded around the nest as the baby sea turtles slowly emerged and crawled into the water. “A truly awesome sight,” Maxwell said. Mary Nacey, of San Carlos Peninsula Humane Society, is the "squirrel whisperer." Nancey is the one the shelter's Wildlife Care Center entrusts with its most fragile rescues: baby squirrels. 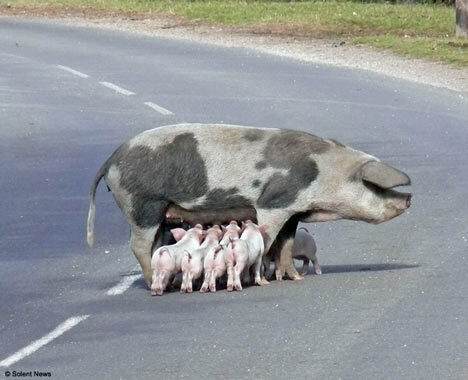 She gives them the mothering they need to survive and then knows when to pull away so they can be the wild creatures they were meant to be. "Unfortunately, orphaned, sick and injured wild animals don't always make it," said Scott Delucchi, spokesman for the humane society. "Mary's very caring and is good about giving the animals TLC, but she is also good about setting boundaries and understanding when and how to let go." A bizarre breed of guinea pig that was created for laboratory testing more than 30 years ago has become the latest designer pet. 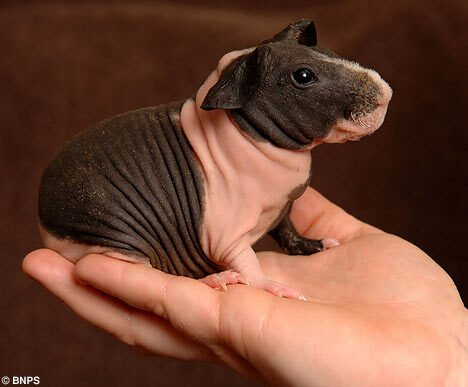 The skinny-pig has no hair on its body except for tufts on its face and feet - so needs strong suncream in the summer and a jumper in winter. What do you think, kind of cute? On second thought, I'll hold it. 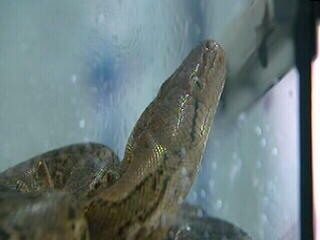 A 38-year-old Brooklyn woman got quite a surprise when she used her bathroom Monday morning. The New York Daily News is reporting that Nadege Brunacci was washing her hands when she glanced at the toilet and saw a 7-foot python staring back at her. The New York Zoos and Aquarium has developed a Web site that allows visitors to transform themselves into an animal, or combination of animals, of their choice. The photo at left is what I looked like before I started. 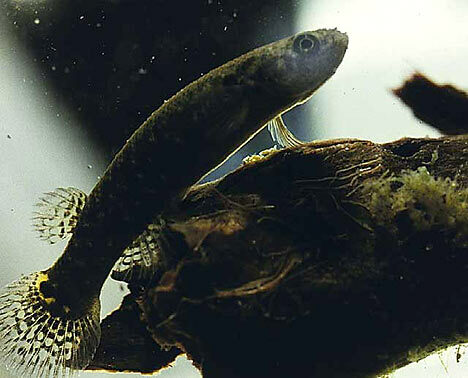 With a flat shell, the Argentine snake-necked turtle (Hydromedusa tectifera) often rights itself by pressing its head against the ground with its muscular neck, levering itself onto its belly. Credit: Gaabor Domokos. For turtles, lying belly-up is a helpless, life-threatening situation. Now it appears many turtles evolved shells with unique shapes to easily help them flip back onto their bellies if they find themselves on their backs. "Before starting this project, I always thought animals such as turtles worked hard to right themselves, and what this showed was this need not be the case—they can just have a good shape for their shell that does most of the work," applied mathematician Peter Varkonyi at the Budapest University of Technology and Economics in Hungary told LiveScience. Was that d-e-e-r or d-e-a-r? Fifth-grade students in a vocabulary class in Aberdeen, N.J., got an unexpected lesson in animal sciences when a deer crashed through their classroom window. Teachers Brenda Adelson and Bonnie McCullough had just moved from the front of the room when the buck burst in at 10 a.m. Tuesday, the Asbury Park (N.J.) Press reported. The deer trotted through the classroom into a hall, into the vacant nurse's office, the staff lounge and finally into the empty cafeteria of Lloyd Road Elementary School. This is exactly what my cat Bandit does to me every morning. Oh sure, blame it on the cat! Devils and pumpkins and princesses, oh my!